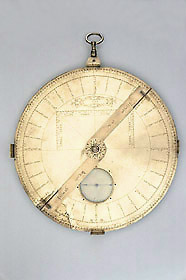 This simple theodolite was principally intended for horizontal surveying and carries both a scale of degrees and a subdivided circular scale of compass directions. Its four fixed sights also enabled it to be used as a surveyor's cross. When oriented with the help of the magnetic compass, bearings would be taken with the pivoted alidade. The alidade is however a modern replacement, provided by the Belgian collector Henri Michel who added a chronogram inscription 'DeLIneaVIt refeCItqVe MICheL brVXeLLIs' for the year 1930. The instrument has a shackle and suspension ring and can therefore also measure vertical angles, using either the degree scale or a double shadow square.